Pamper your skin with Evolution of Smooth's rejuvenating skin care & lip care products. Indulge in the best lip balm, hand lotion, shaving cream & body lotion! I love this hand lotion by eos. It's the perfect size for in your purse or diaper bag and great for using while out and about. eos Hand Lotion is velvety soft and absorbs into skin quickly leaving it soft and moisturized. I also love that this hand lotion is packed with nourishing shea butter, aloe and oats helping to keep your hands looking soft and moisturized all year long. eos lip balm is not only cute but it works wonders on dry lips. I love the strawberry sorbet flavor. It reminds me of sorbet ice cream and tastes like dessert. 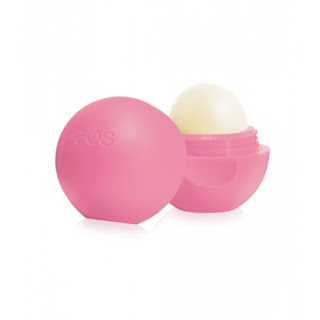 eos lip balm helps to soften lips in a matter of minutes and protects them from becoming dried out. The container is also the perfect size to toss in your purse or diaper bag. To find a retailer near you to purchase click HERE. Follow EOS on social media!